Inlet Point Villas Is a quiet, family-oriented, gated community with a tennis court, swimming pool and basketball court and grilling area on the grounds. The beach, at low tide, is enormous and allows for long walks along the ocean, or time to explore the tidal pools that develop with the ever-changing beach landscape. Behind the private gate of this North Myrtle Beach vacation condominium complex, you will discover a tranquil setting. This nautical paradise offers families one-, two- and three-bedroom condominiums. These vacation condos do not sit high upon stilts, so the stairs are not imposing and are rather wide. Go beach combing for seashells and look for crabs that bury into the soft white sand. Just several blocks away from Inlet Point Villas are a boat ramp, trailer parking and even a pier. And you are just a short walk to Cherry Grove. You also can fish from the lake on property or take a short trip to the Cherry Grove Pier. This paradise beach resort was built in 1978 and has seen its fair share of development at the beach. Inlet Point Villas has 15 stand-alone buildings featuring six condominiums per building, with a total of 90 condominiums. The majority of the units have ocean and inlet views, and the remaining units have serene pool or lake views. 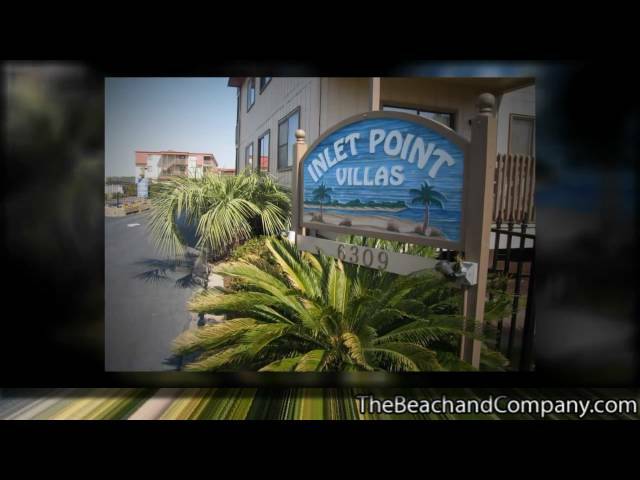 Come visit us at Inlet Point Villas! Stay in one of the lovely condominiums and enjoy the tranquility of the ocean waves as they caress the shore while you are relaxing and drinking your morning coffee on your private balcony. You, too, will want to make it your new beach retreat.